I've been to Mamak three odd times now, this place never let my stomach down. Have their meals for breakfast and you won't be hungry for the next two days. We were just in time for their lunch specials. 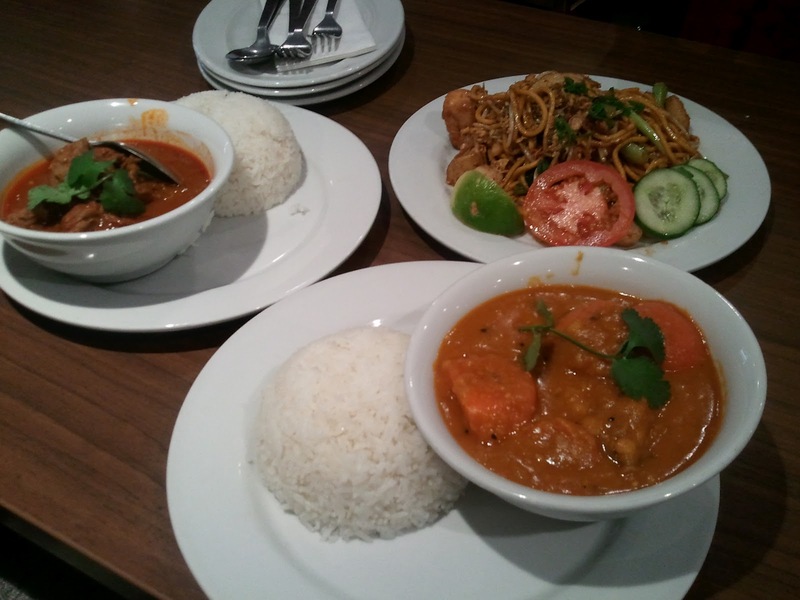 The curries were approx $10-13 each (memory lapse). Curry cooked with lentils, fresh tomatoes, carrots, potatoes and eggplant. I was craving curry after mum's poor attempt to make authentic curry, I think she just put the colour powder in. This curry was authentic and potent! We were both on the verge of tearing. 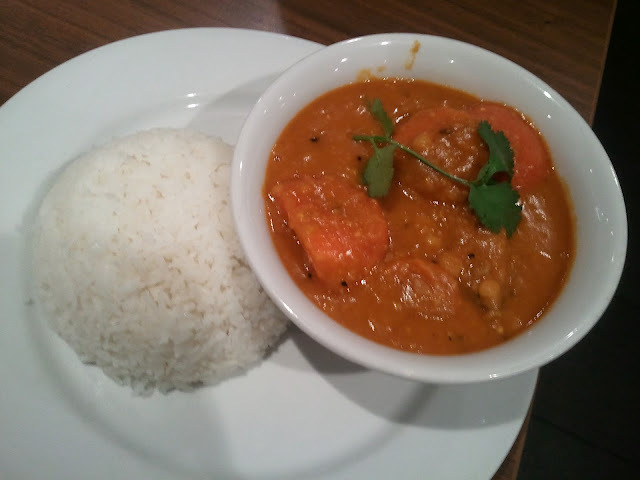 I never knew vegie curry could be so delicious! 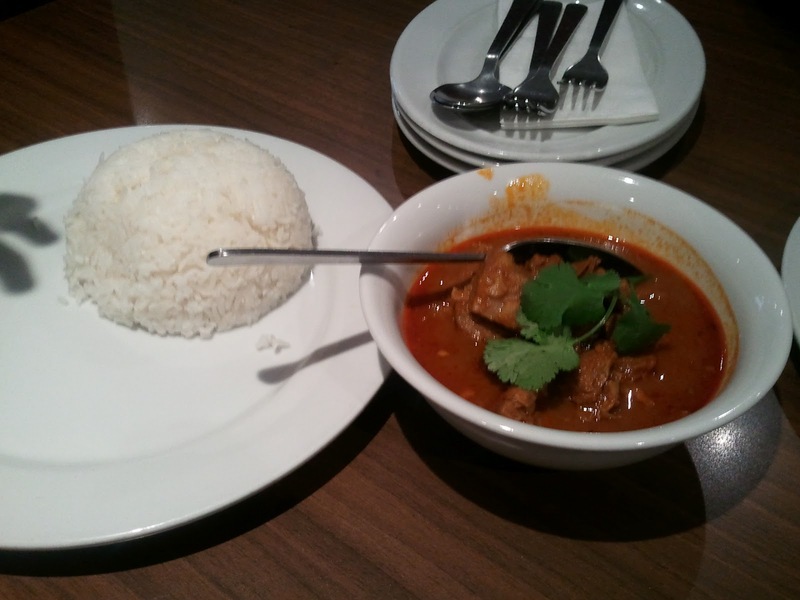 Spicy lamb curry slow-cooked, SO TENDER, amazing flavours. I can't think of anything negative about these curry dishes. 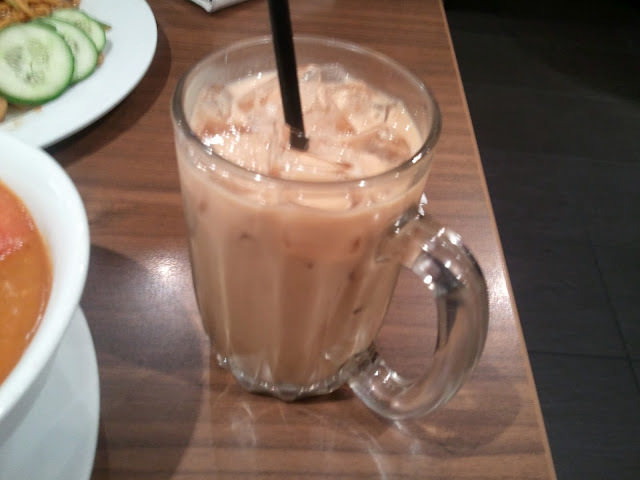 Ice milk tea with condensed milk, nom nom nom nomnomnomnomNOMNOMNOMNOM!!!!! Best ice milk tea I've ever had... If you ordered a curry, ensure to pair it up with a cold drink. Your throat and stomach will thank you for it, and you can thank me later. 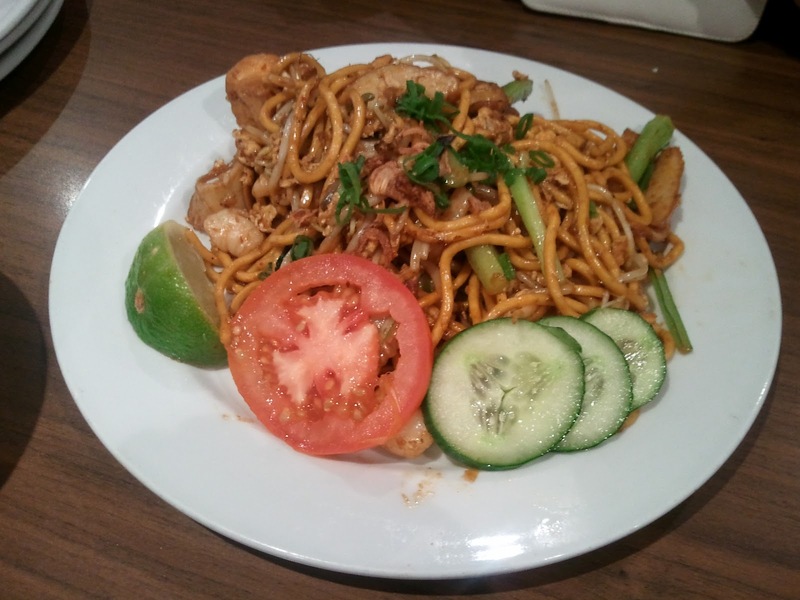 I don't think Mamak is over-rated, they serve good food, and therefore receive positive reception/ eager diners lining at their doors on a nightly basis. Customers pay for quality, service and value. 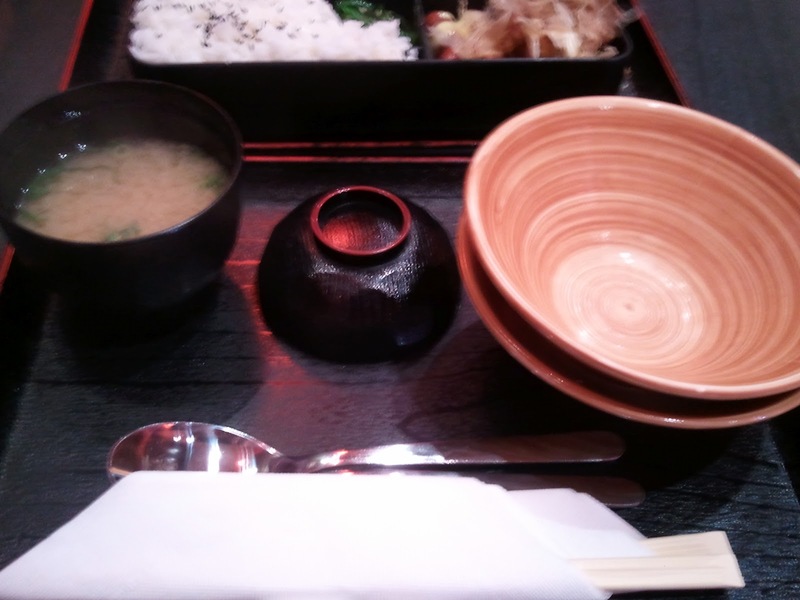 I've enjoyed this restaurant thoroughly thus far, this has become one of my regular lunch-out destination. It's been roughly 6 months since my last visit to On Ramen. I was kindly invited back by the shop owner. I was impressed with the overall improvement; ambiance, furnishing, interior decor, expanding menu and quality of food. Needless to say, service was friendly and warm as always. My first time trying Calpis water... my friend ordered it, I'm not experimental enough to order various forms of water from any menu. But this was quite refreshing, essentially, non-fizzy lemonade. I'm not big on fizzy drinks so this was great. 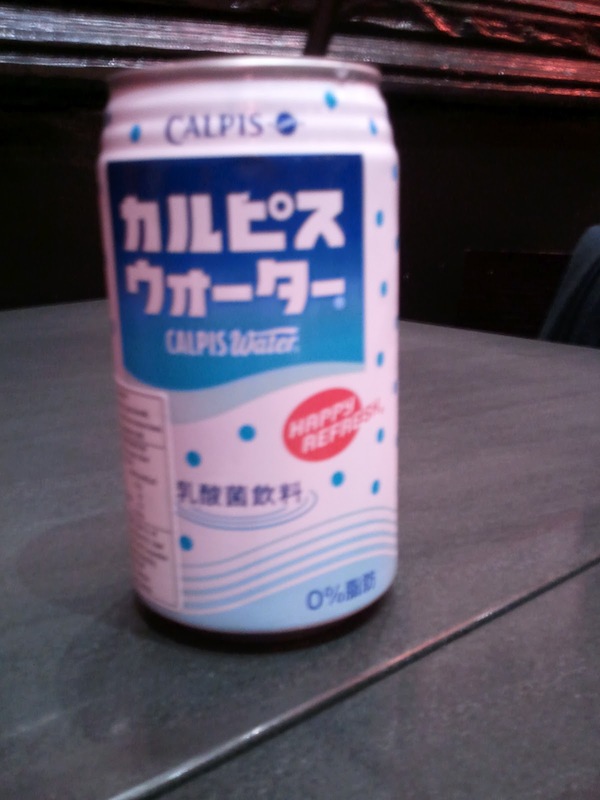 In addition to this newly discovered Calpis water, On Ramen is now serving table water with a hint of lemony zest (real lemons). Serving was quick. Agedashi tofu for entree, I'm sold. I will be eating lots of agedashi from now on. 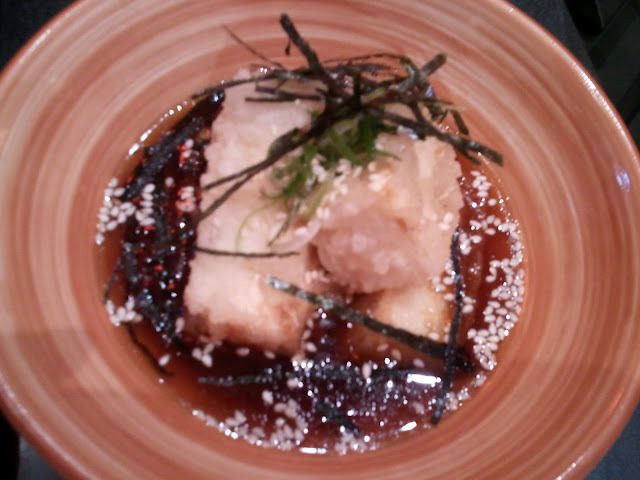 Tofu was deep fried and cooked to perfection, corresponds nicely with the sauce. We both took a bite, looked up at each other and smiled. Ronan Keating was right, you say it best when you say nothing at all, especially when making food references. I was surprised and excited to see their new menu. I love bentos and I love unagi. In my previous review, I mentioned the changes in their salad sauce... well guess what.. it's back to exactly how I remembered when I first tried it, delicious. Always been a fan of their sausage and mustard combo + fish flakes & octopus balls (I think that's what they are). 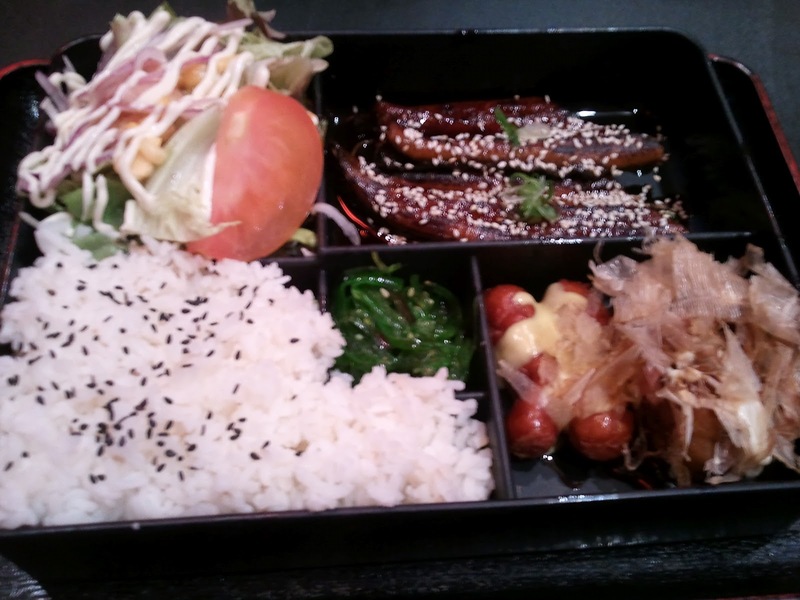 Unagi was tender, flavoursome and fresh. Miso was.. well miso is miso, You can't go wrong with miso. For Students: 10% off, daily from 2.30pm to 5.30pm. Monday Night Ramen: From 6pm. 10% off any Ramen noodle, Set or Bento. Kids, keep a keen eye on On Ramen, I think this little gem across the road from Capitol has returned. Made my way to Lindt cafe on a chilly and windy afternoon. Ordered the hazelnut flavoured hot chocolate (sorry, I can't tell you the price, the cafe menu strayed from their website-- it was approximately $5-6). It was my first time there, obviously unaware that I had to mix my own hot chocolate, being the idiot that I am, I started scooping the milky froth and commented, "This tastes like.... milk"
My friend replied, "It... is milk. 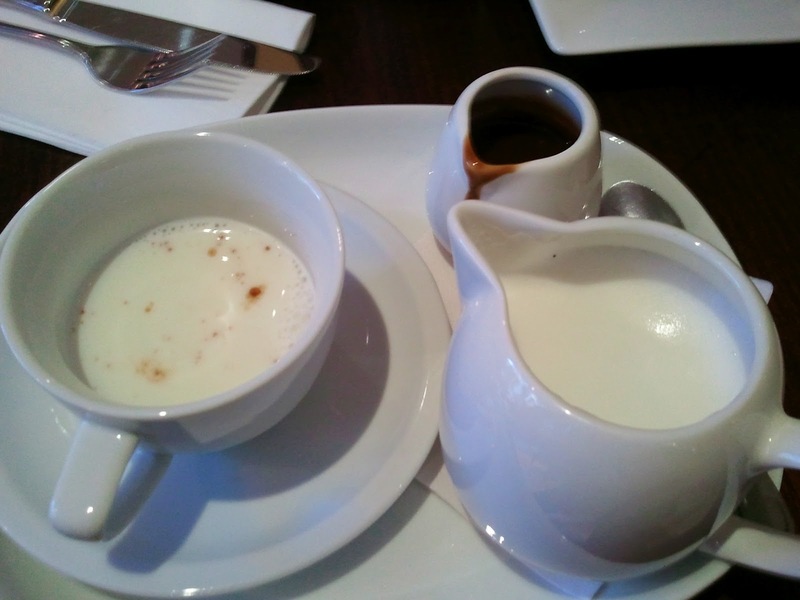 You're meant to mix the milk and chocolate together in your own cup"
Silky smooth texture running down your throat. Lovely rich hazelnut flavour. I enjoyed it very much! 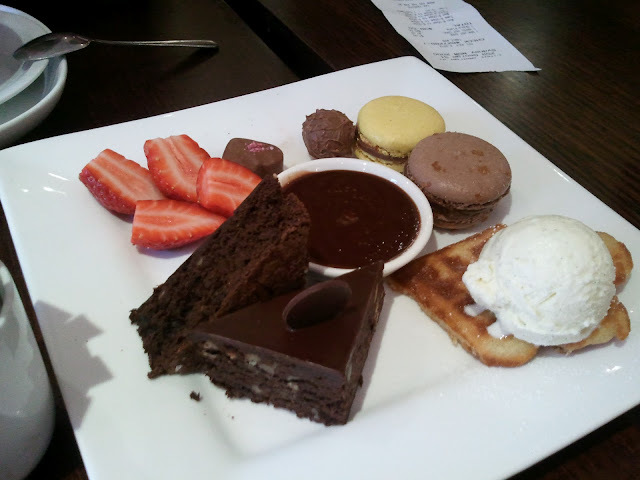 Also got the tasting plate, it was nothing too special to be honest. Tagged at approx $25.50. Hefty. I prefer San Churros' churros.. I've had so much Zumbo macrons, it's all starting to taste similar. We got a strawberry filled chocolate, the other piece was a bit of a fondant. I did enjoy the waffle with ice cream, I'm guessing it's white chocolate/vanilla bean flavoured. There was this awesome yet peculiar taste of white gold mudcake. 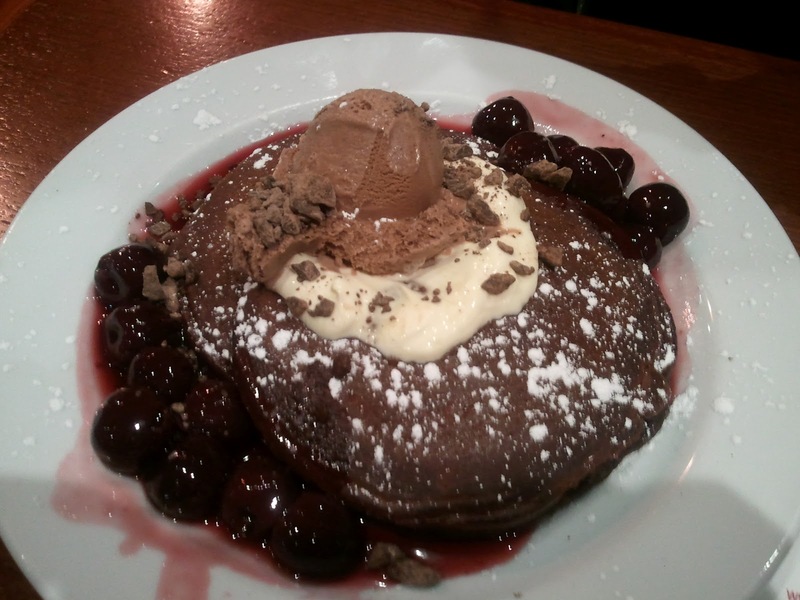 I'll be back to try the sundae, hot chocolate and more ice cream waffles! Best way to end the day, sunset! Finally saying adios to the cosmetics industry. Downside.. I have to start buying my own make up. However, working in the industry made me cut down on prep time and limiting the toxics I smear on my face, how ironic. Mascara and tinted moisturiser are two things I can't go without. First time in a while I went to pancakes to actually have dessert. Someone introduced me to the Ultimate. It really is.. THE ULTIMATE. 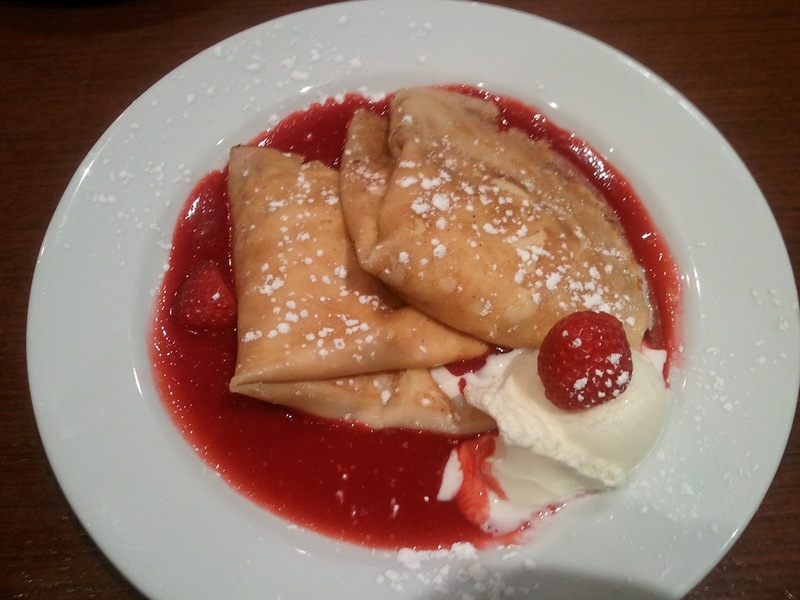 Heavy duty cream cheese, raisins in a crepe, topped with strawberry coolie. It's quite sweet, I love it. Half way through the second crepe I felt like throwing up, but I was greedy and ate the whole thing. Recommended for two people. My friend got the blackforest cherry. Personally, I'm not too big on their pancakes (Other than the Strawberry Patch)... it's quite heavy, thick and the occasional bi-carb imbalance. Chat Thai Haymarket was my place to go for thai. My first visit to Chat Thai at Westfield was rather pleasant, generous serving and adequate customer service. Last week was a shocker. We wandered into the restaurant trying to catch a waiter's attention.. while they were too busy chatting among themselves. Few minutes later, we were finally seated.. on an outrageously dirty table. Took us another 5 minutes to hail down a waitress to take our order. We asked her for some recommendations, her manner was stern and impatient. Unfortunately I forgot to take a picture of our main, it was a wet noodle dish... not too bad. After we finished, we waited around for dessert.. we waited for another 20 minutes attempting to hail down a waitress... 10 years later, our dessert finally arrived. Above is the Lodt Shong Singapore $4.50- coconut milk with silky pandan dumplings. It was probably one of the most delicious drinks I've had! 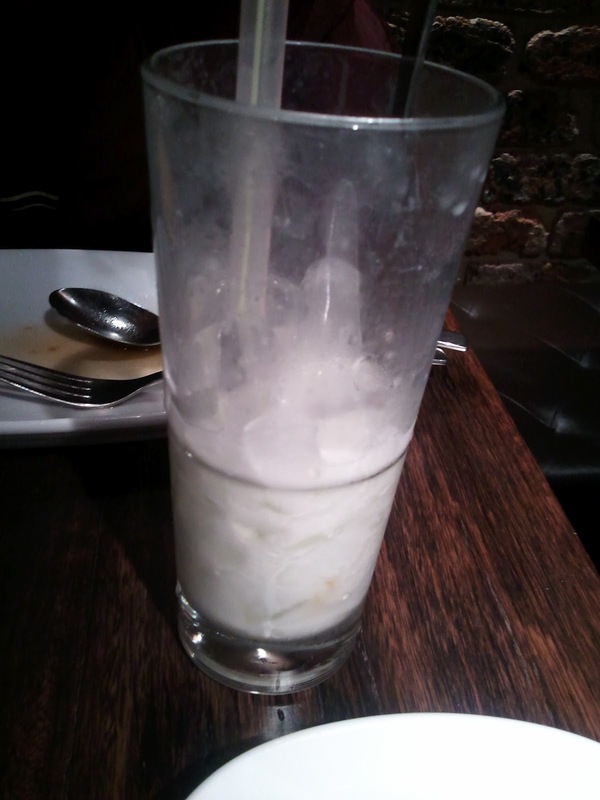 I haven't had many thai or viet drinks.. I better brush up on that. Only excess.. too much ice! 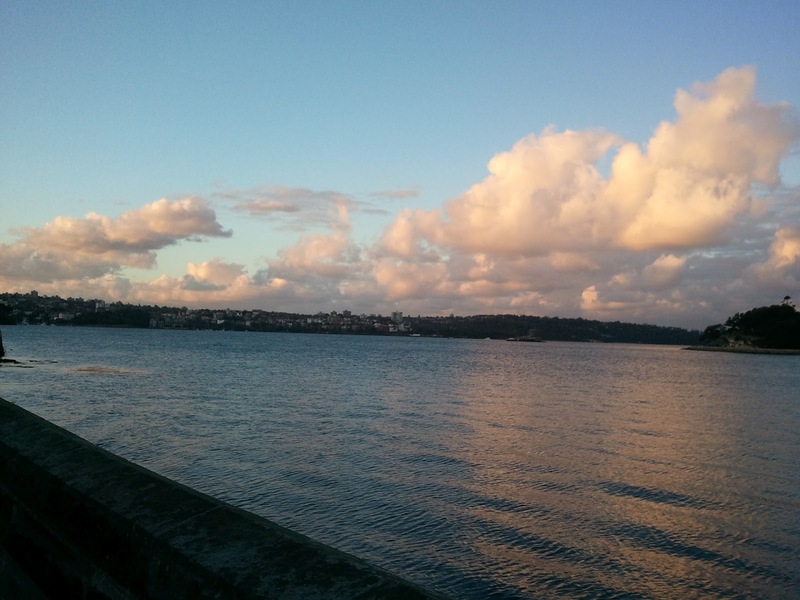 My apologies, I don't know why blogspot publish some of my photos vertically.. obviously lacking intellect. Anyway. 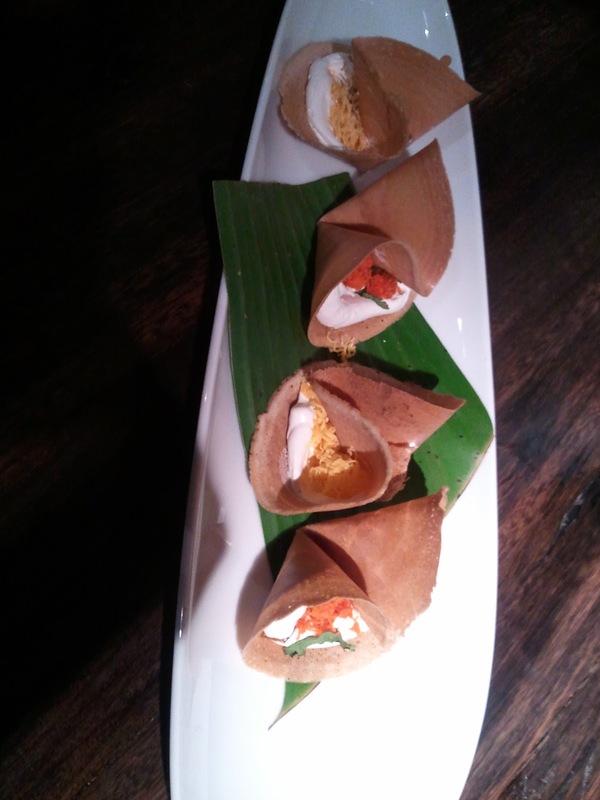 above is Khanom Buaing (I think it was $8.50 for four)- Sweet thin wafers filled with meringue and candied egg yolk (yellow) or candied herb and dried shrimps (red). Prefer the yellow ones, red was too sweet. It was "interesting", something that I'd only try once. Overall.... service was absolutely terrible. Food didn't make up for it either. I definitely will not be returning. Chat Thai, fix your services at Westfield!!! I take forever to finish products, I'm also a slow eater. But I finally polished off few of my many skincare/cosmetics. Kakadoodle Dew Nourishing Day Cream 15ml - Quite rich, I liked the scent. I did keep my skin moisturised than most moisturisers. BYS Candyfloss Blush 5g- Worst blush I've used, breaks down like an emo kid with too much eyeliner. The colour was a nice babydoll pink. Elizabeth Arden Ceramide Mascara - This mascara gives you incredible lengthy, natural lashes. Lancome Hypnose- I love Lancome mascaras. Already re-purchased. Pinetarsol- I got this fucked up skin condition on the back of my arms after sleeping on the living room sofa for 6 months. I got itchy bites all down my arm, probably from spiders, mites or some sort of insects. Initially, I used soap-- it only made my spider bites worse. I hopped into Priceline and took this baby home. This is excellent for sensitive skin, completely calmed my bites down.